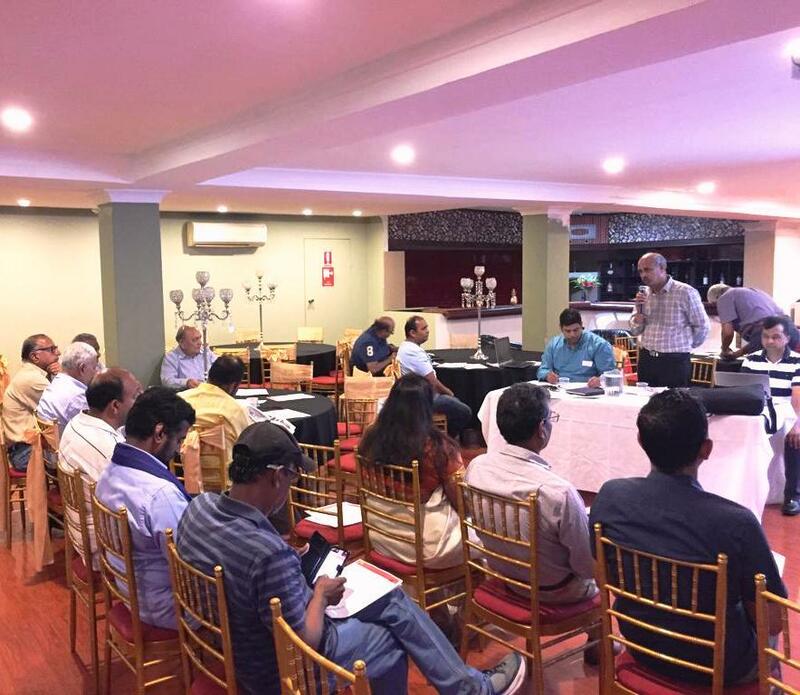 Hindu Concil of Australia (HCA) started actively working in Victoria since April 2014 although it was represented through some other Hindu organisations here since about 2010. HCA actively partners with core Hindu organisations such as Hindu Swaymsevak Sangh, Vishwa Hindu Parishad and Seva International. By: Makarand Bhagwat, Victoria Chapter of Hindu Council. 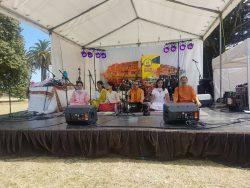 A team of devoted volunteers from Hindu Council of Australia (Vic) participated in the Festival of Chariots (Rath Yatra) organised by its partner organisation, ISKCON, Melbourne at Catani Gardens during the recent St Kilda Festival on Sunday 10th February in Melbourne. The group presented half an hour long spiritual bhajans on this occasion. 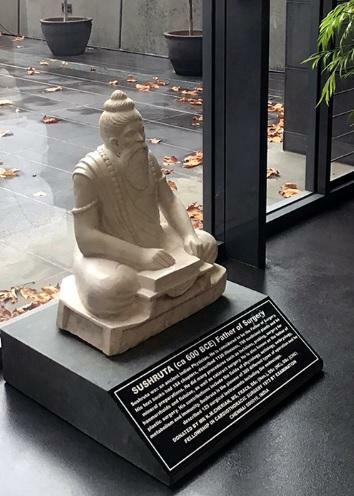 HCA (Vic) has a strong ongoing relationship with ISKCON in Melbourne and supports their spiritual health care providers who provide chaplaincy services in the health care system. HCA actively partners with core Hindu organisations such as Hindu Swaymsevak Sangh, Vishwa Hindu Parishad and Seva International, ISKCON, Sankat Mochan Samiti. 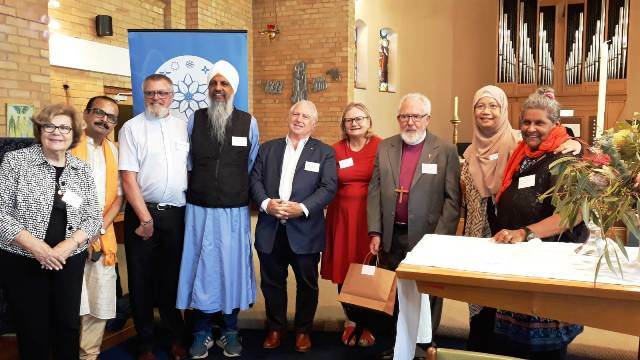 Hindu Council of Australia (Vic) joined faith leaders at the celebration of the 2019 UN World Interfaith Harmony Week, to stop and listen to the voice of aboriginal and Torres Strait islander people in hope of reconciliation and healing our nation’s broken heart. 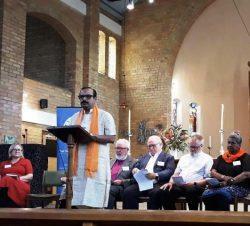 The event was held on Sunday 17th February at St Oswald Anglican Church, where Makarand Bhagwat, on behalf of Hindu Council of Australia (Vic) joined leaders from Christian, Jew, Buddhist, Islam and Sikh faith leaders and extended the support of Hindu community, to seek constitutional reforms to empower the aboriginal and Torres Strait Island community people. How could it be otherwise? That peoples possessed a land for sixty millennia and this sacred link disappears from world history in merely the last two hundred years? With substantive constitutional change and structural reform, we believe this ancient sovereignty can shine through as a fuller expression of Australia’s nationhood. 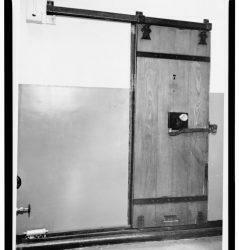 Proportionally, we are the most incarcerated people on the planet. We are not an innately criminal people. Our children are aliened from their families at unprecedented rates. This cannot be because we have no love for them. And our youth languish in detention in obscene numbers. They should be our hope for the future. These dimensions of our crisis tell plainly the structural nature of our problem. This is the torment of our powerlessness. trek across this vast country. We invite you to walk with us in a movement of the Australian people for a better future. Hindu Council of Australia’s Victoria chapter has completed distribution of kits to 11 accredited Hindu Spiritual Care Providers (Chaplains). The kit contains a lanyard and ID, a copy of Bhagvad Geeta, Rudraksh Mala, and a neck scarf. HCA Victoria is currently looking for volunteers who can be trained as Spiritual Care Providers especially from linguistically diverse backgrounds. 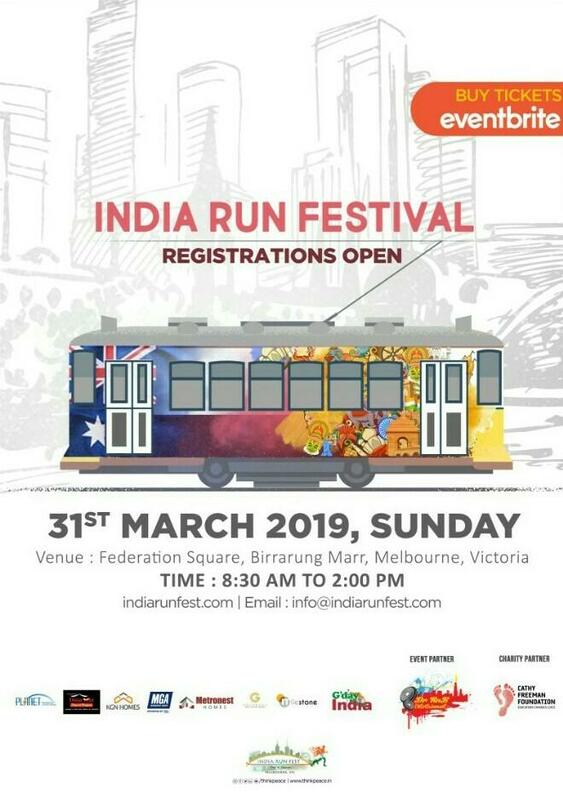 We encourage interested persons speaking Gujarati, Bengali, Punjabi, Telugu, Tamil, Kannada and Malyalam languages to send their expression of interest to melbourne@hinducouncil.com.au with your contact details. A training session is proposed in April 2019 for volunteers. 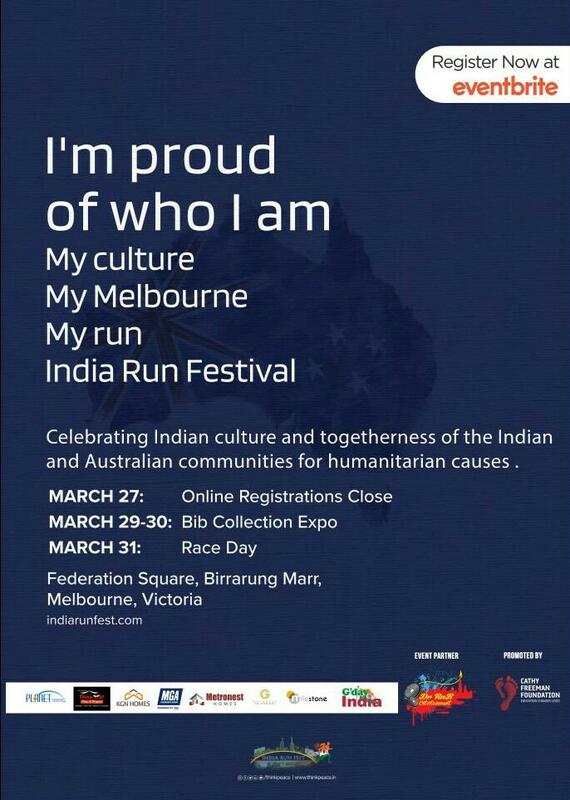 By: Hindu Council Melbourne Chapter. 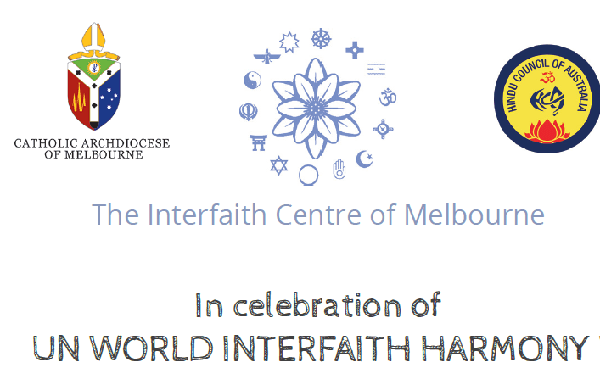 The Melbourne chapter of Hindu Council participated in and supported 2019 UN World Harmony Week. The event was attended by Mr Makarand Bhagwat. World Interfaith Harmony Week is a UN resolution for a worldwide week of interfaith harmony proposed in 2010 by King Abdullah II and Prince Ghazi bin Muhammad of Jordan. The World Interfaith Harmony Week falls in the first week of February of every year and aims to promote harmony between all people regardless of their faith. The basis for the World Interfaith Harmony Week is the A Common Word Initiative which was authored by Prince Ghazi bin Muhammad and released in 2007. The A Common Word Initiative and the World Interfaith Harmony Week stem from the idea that humanity is bound together by the two shared commandments of ‘Love of God and Love of the Neighbor’ or ‘Love of the Good and Love of the Neighbor’. 64/81 of 7 December 2009 on the promotion of interreligious and intercultural dialogue, understanding and cooperation for peace, and 64/14 of 10 November 2009 on the Alliance of Civilizations. Recognising the imperative need for dialogue among different faiths and religions in enhancing mutual understanding, harmony and cooperation among people. Recalling with appreciation various global, regional and sub-regional initiatives on mutual understanding and interfaith harmony including, inter alia, the Tripartite Forum for Interfaith Cooperation for Peace, and the “A Common Word”. Reaffirms that mutual understanding and inter-religious dialogue constitute important dimensions of a culture of peace. Proclaims the first week of February of every year the World Interfaith Harmony Week between all religions, faiths and beliefs. Encourages all States to support, on a voluntary basis, the spread of the message of interfaith harmony and goodwill in the world’s churches, mosques, synagogues, temples and other places of worship during that week based on Love of God and Love of the Neighbour, or based on Love of the Good and Love of the Neighbour, each according to their own religious traditions or convictions. Requests the secretary general to keep the General Assembly informed of the implementation of the present resolution. By : Makaran Bhagwat, Melbourne. Hindu Council of Australia (Vic) currently has volunteer spiritual care providers (Hindu Chaplains) who have been providing their services in the health care system and are now extending it to other areas include prisons. A Women’s Prison in Victoria : We currently have an Indian woman here who follows Hinduism and she has requested to be linked in with someone from a Hindu Temple. It was suggested that you might be able to assist with organising someone to come in and meet with her. I am also seeking some advise in regards to her celebrating Shradh. She has requested specific food items for these celebrations, but I have not had much luck through the prison, so was hoping you might be able to direct me in regards to this as well. We visited the Centre and had an opportunity to meet the 2 inmates requesting this meeting. 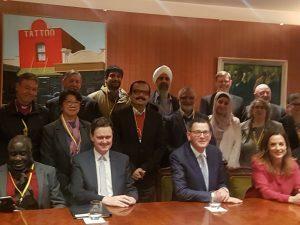 It appears that both of them have 2 main requirements / requests to be granted, which are related to the Hindu faith and Indian ethnicity, which Hindu Council of Australia are able to fulfill. We were told that in the multifaith chapel at the centre, while there were provisions for other faiths, there is nothing at present for the Hindu faith. We can assist here by providing, religious texts, and also picture frames of Hindu Gods which can go on the Chapel wall to support their prayers. Secondly, both of them were saying that the other inmates belonging to other communities, could buy the food items of their taste and choice from the store within their weekly allowance. Unfortunately there is no Indian grocery available for them to cook food of their choice. Again on this point Hindu Council of Australia can assist by engaging with the Centre to identify some basic items, like spices, Basmati rice, lentils etc so that they can be purchased for their cooking needs. In addition to this, for the forthcoming important Hindu festival “Diwali” ,the festival of lights, they would like to light a candle at the current interfaith place / chapel. Overall it was a good visit and we have given them some printouts of the prayers, which can hopefully bring in some positive feeling in them in the current circumstances. Hindu Council of Australia Victoria is a member of the Multifaith Advisory Group under the Department of Premier and Cabinet (DPC) , which advises the Premier and the minister for multicutural affairs on faith related matters in the community. Some of the issues MAG discussed in the recent times were the Voluntary Assisted Dying Bill, LGBTI inclusion in the broader community, Family Violence, Issues related to Islamic community and achieving social cohesion to name a few. MAG Chair is Helen Kapalos, who is also the Chair for Victorian Multicultural Commission. Helen organised a meeting with the Premier and the Minister way back in Apr-May this year and scheduled it for 15th August, which was yesterday. HCA was represented in this meeting. Although the meeting was short, some of the recent issues were discussed. The meeting started on the backdrop of the recent comments made in the Senate by Katter’s party Senator Fraser Annings about bringing back the white Australia policy and opposing to Islamic migration. The MAG unanimously condoned Senator’s comments. The other issue which was discussed was about the South Sudanese youth violence in the recent past in Melbourne suburbs. Bishop Philip Huggins from the Anglican Church said that he is working with the Sudanese community on this issue. All the faith communities expressed their support and asked if they could help. The Premier also commented that steps are being taken to provide training and job opportunities to the South Sudanese youth to bring them into the mainstream. The Premier announced financial assistance of $600,000 to MAG which was welcomed by all faith leaders. HCA will work closely with the MAG in future to positively contribute on all emerging issues. 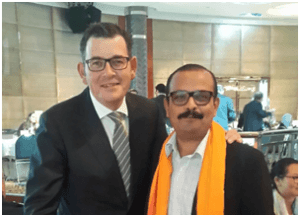 After the meeting I personally thanked the Premier on attending the Indian national flag hoisting ceremony over the week end at the Federation Square. The statue was donated to the college by one its Alumni, Dr K M Cherian. Dr Cherian performed India’s first successful Coronary Artery bypass surgery in 1975. He also performed the country’s first heart transplant after legalization of brain death. The first Heart- Lung Transplant, the first Paediatric Transplant and the first TMR (Laser Heart Surgery) were also performed by him. He started his career in Christian Medical College Hospital, in Vellore as lecturer in Surgery. He did his FRACS in Cardiothoracic Surgery in 1973 from RACS, while being a migrant in Australia. He also worked in New Zealand and the United States. He worked as a Special Fellow in Paediatric Cardiac Surgery in Birmingham, Alabama under Dr. John W. Kirklin and in the University of Oregon under Dr. Albert Starr. He is an honourable Prof at the Yangzhou University, China. He was awarded Padma Shri by the Government of India in 1991. Dr Cherian is very fond of and inspired by Sushruta. The Indian epic Mahābhārata lists Suśruta amongst the sons of Viśvāmitra, the legendary sage. 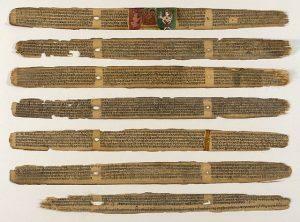 The Bower Manuscript, an early birch bark document, dated to the Gupta era (between the 4th and the 6th century), is an Indian text and is one of the oldest manuscripts known to have survived into the modern era. It mentions the ancient Indian tradition of “garlic festival”, as well as a mention of sage Sushruta in Benares (Varanasi). 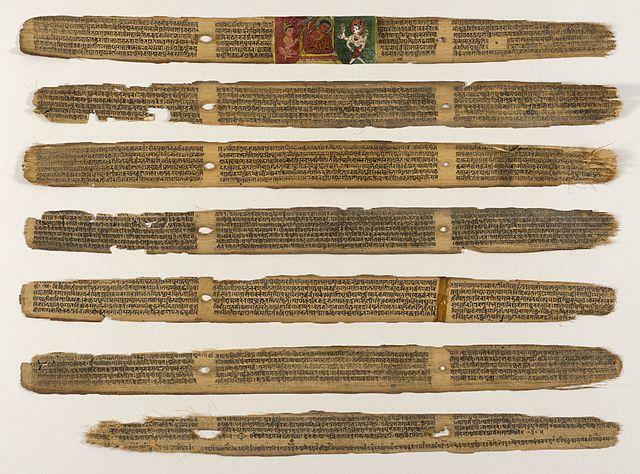 The Suśruta-saṃhitā (works of Sushruta) is one of the most important surviving ancient treatises on medicine and is considered a foundational text of Medicine. The treatise addresses all aspects of general medicine, and the translator G. D. Singhal dubbed Suśruta “the father of surgery” on account of the extraordinarily accurate and detailed accounts of surgery to be found in the work. 57 preparations based on animal sources. It enumerates six types of dislocations, twelve varieties of fractures, and classification of the bones and their reaction to the injuries, and gives a classification of eye diseases including cataract surgery. 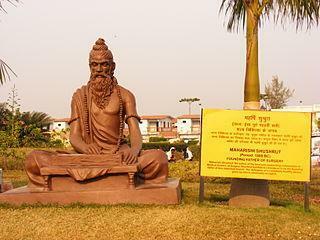 Sushruta says that in his works, he has presented the teaching of his guru, Divodāsa a physician who taught in a school in Kashi (Varanasi, India) in parallel to another medical school in Taxila (on Jhelum river, ancient India), sometime between 1200 BC and 600 BC. The text uses terminology of Samkhya and other schools of Hindu philosophy. The text was translated to Arabic as Kitab Shah Shun al-Hindi’ in Arabic, also known as Kitab i-Susurud, in Baghdad during the early 8th century at the instructions of a member of the Barmakid family of Baghdad. Yahya ibn Barmak facilitated a major effort at collecting and translating Sanskrit texts such as Vagbhata’s Astangahrdaya Samhita, Ravigupta’s Siddhasara and Sushruta Samhita. The Arabic translation reached Europe by the end of the medieval period. In Italy, the Branca family of Sicily and Gaspare Tagliacozzi (Bologna) became familiar with the techniques of Sushruta. A cataract surgery was found by Sushruta and was subsequently introduced to other countries. Sushruta Samhita mentions the operation in which a curved needle was used to push the opaque phlegmatic matter (kapha in Sanskrit) in the eye out of the way of vision. The cataract operation method described by Sushruta continued to be used throughout the Middle Ages and is still used in some parts of Africa and in Yemen. For the most part, it has now been replaced by extracapsular cataract surgery. The first references to cataract and its treatment in Europe are found in 29 AD in De Medicinae, the work of the Latin encyclopedist Aulus Cornelius Celsus, who used Sushruta’s method and called it Couching. The Sushruta Samhita states, per Hoernle translation, that “the professors of Ayurveda speak of three hundred and sixty bones, but books on Salya-Shastra(surgical science) know of only three hundred”. The text then lists the total of 300 as follows: 120 in the extremities (e.g. hands, legs), 117 in pelvic area, sides, back, abdomen and breast, and 63 in neck and upwards. The text then explains how these subtotals were empirically verified. The discussion shows that the Indian tradition nurtured diversity of thought, with Sushruta school reaching its own conclusions and differing from the Atreya-Caraka tradition. The Sushruta Samhita is best known for its approach and discussions of surgery. It was one of the first in human history to suggest that a student of surgery should learn about human body and its organs by dissecting a dead body. A student should practice, states the text, on objects resembling the diseased or body part. Incision studies, for example, are recommended on Pushpaphala(squash, Cucurbita maxima), Alavu (bottle gourd, Lagenaria vulgaris), Trapusha (cucumber, Cucumis pubescens), leather bags filled with fluids and bladders of dead animals. Reconstructive surgery techniques were being carried out in India by 800 BC. 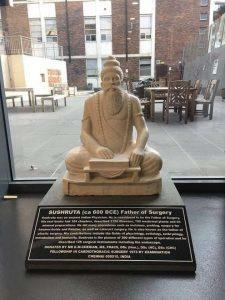 Sushruta made important contributions to the field of plastic and cataract surgery. The medical works of both Sushruta and Charak, are originally in Sanskrit language. British physicians traveled to India to see rhinoplasties being performed by Indian methods. 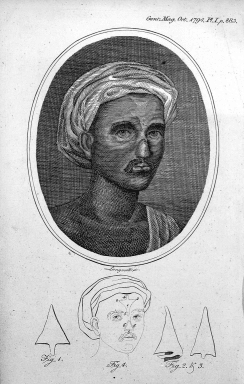 Reports on Indian rhinoplasty performed by a Kumhar vaidya were published in the Gentleman’s Magazine by 1794. Joseph Constantine Carpue spent 20 years in India studying local plastic surgery methods. and finally in 1814, he performed the first major surgery operative procedure on a British military officer who had lost his nose to the toxic effects of mercury treatments. 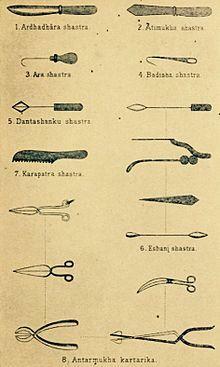 Instruments described in the Sushruta Samhita were further modified for use in the Western world. Sushruta, states Tipton, asserts that a physician should invest effort to prevent diseases as much as curative remedial procedures. An important means for prevention, states Sushruta, is physical exercise and hygienic practices. The text adds that excessive strenuous exercise can be injurious and make one more susceptible to diseases, cautioning against such excess. Regular moderate exercise, suggests Sushruta, improves resistance to disease and physical decay. Shushruta has written Shlokas on prevention of diseases. 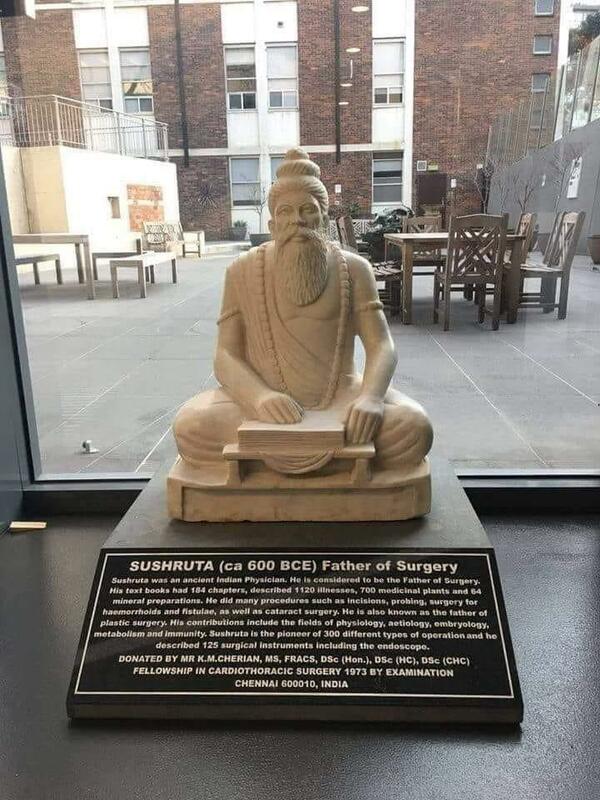 With so much in his book (Sushruta Samhita), no wonder Maharishi Sushruta has been called Father of Surgery and it is no surprise that a prestigious and learned college like The Royal Australian College of Surgeons has given Sushruta such a place of honor in its temple of learning. There will be a short break in both the sessions where light refreshments will be served. If you would like to join this course and become a chaplain, please contact Mr Makarand Bhagwat.